Have you ever taken part in a Twitter Chat? When it comes to repurposing content, we spend a lot of time thinking about what we can post to Twitter, rather than repurposing content that’s already on there. I was keen to speak to someone who’s a real expert in Twitter and a number of my friends pointed to me to Madalyn Sklar as THE person to speak to. They were right! 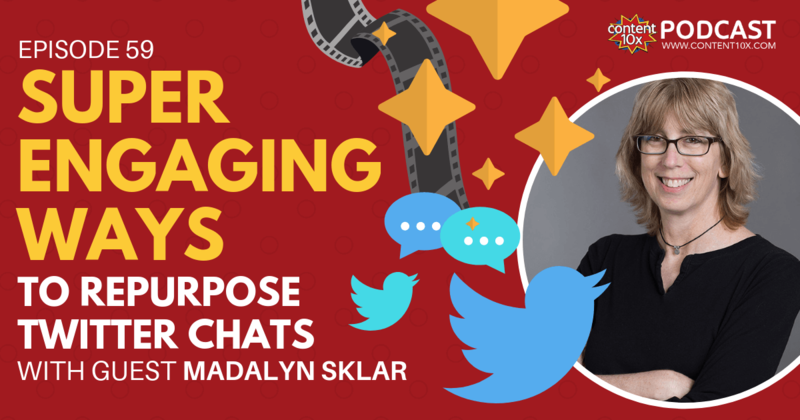 It was a real treat to chat with Madalyn in this podcast episode about the many ways you can repurpose Twitter Chats into other forms of engaging content - Facebook Live streams, YouTube videos, Twitter Moments - the sky really is the limit when it comes to Twitter Chat repurposing! To be completely honest, I had intended to speak to Madalyn about many aspects of Twitter but we started talking about the world of Twitter Chats and never moved away from it. This is a really fascinating episode, especially for people who want to get more out of Twitter but don’t really know how. 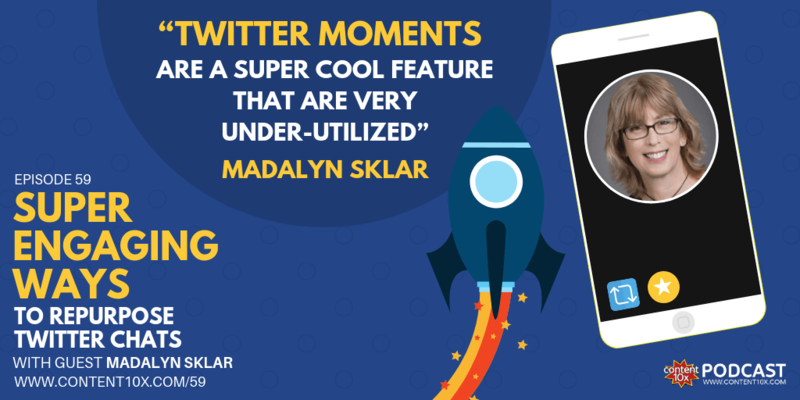 Madalyn is a serial entrepreneur, community builder, and leading Twitter marketing expert. She's ranked the number one social media power influencer in Houston with 22 years of digital marketing experience and 13 years specifically in social media marketing. 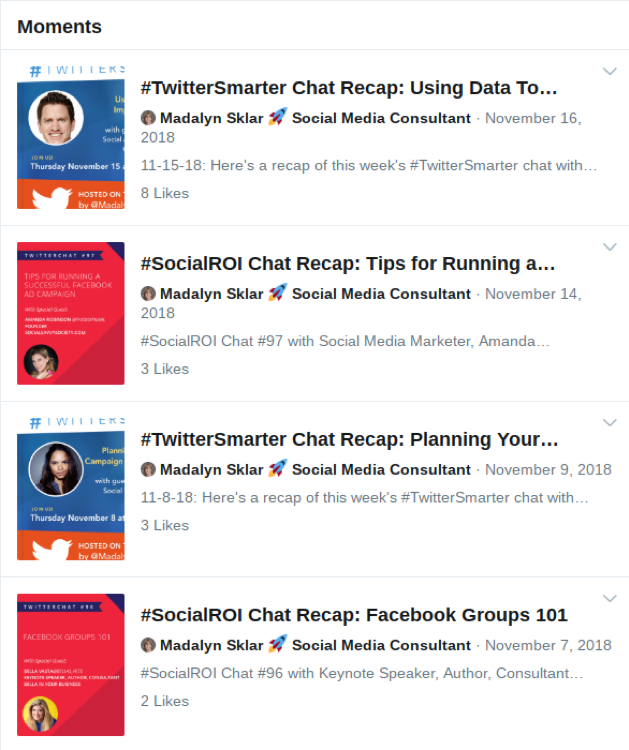 Madalyn is the host of two wildly popular Twitter chats - Twitter Smarter, which was launched six years ago and has since then amassed over 6 billion impressions and her second, Social ROI presented by Manage Flitter. She also hosts two podcasts, Twitter Smarter and she co-hosts Communities That Convert with Kami Huyse. Madalyn explained that she first fell in love with Twitter when the platform was brand new. At the time, it was the only short-format social media platform and she loved that it forces you to be concise and to the point. Even better, she could have lots of meaningful conversations with people that didn’t take up tonnes of time. But she doesn’t just stop there! I knew Madalyn and I would get on well when she said that she too is a great fan of repurposing content! Through the success of the Twitter Chats, she soon realised that there was more she could do to really make the most out of the content she was producing. A Twitter Chat is a way to have a conversation on Twitter by using a specific hashtag, I.e #socialroi. They happen at a set time each week and the host of the chat will ask questions in their tweets, labelling them 1, 2, 3. Participants can then reply to those tweets using the hashtag to join in the conversation. It’s a great way to make friends and share knowledge with people around the globe. 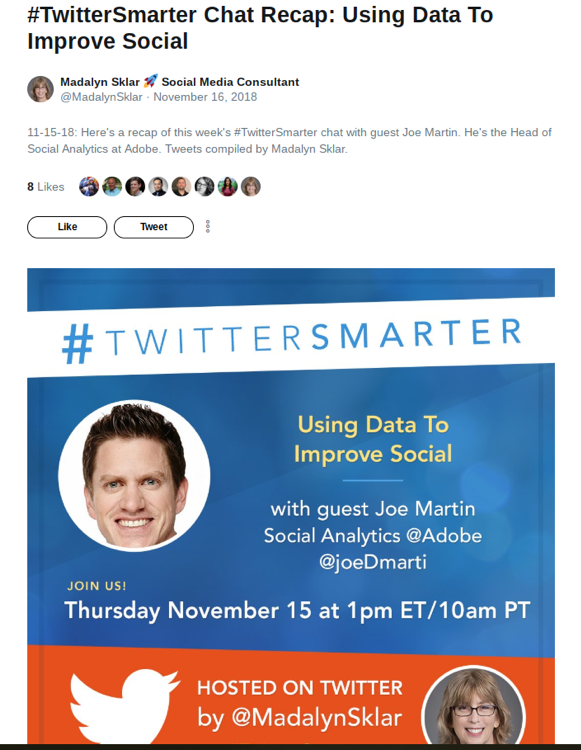 On the podcast Madalyn explained that Twitter Smarter got popular very quickly and this was around the same time that Facebook Live was introduced. Madalyn loved Facebook Live and was keen to incorporate it into what she was already doing, so decided to repurpose the 1 hour long Twitter Chat into a Facebook Live stream. Guests are invited to join Madalyn and her guest on a video call straight after the chat where they discuss the topic of the chat in even more detail. 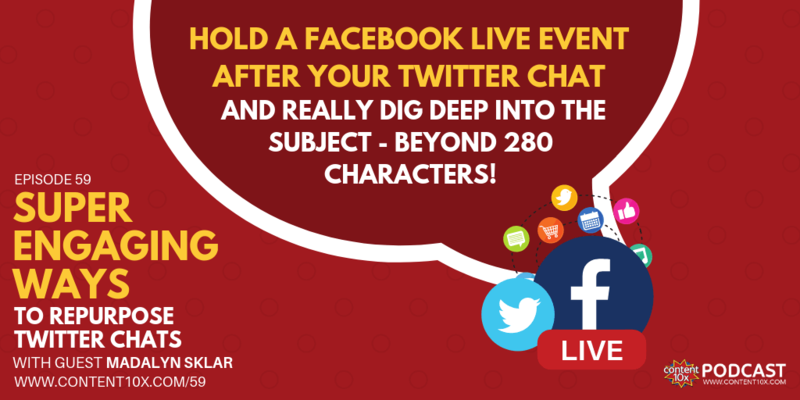 The Facebook Live events work brilliantly for a number of reasons - people are able to ask questions in real-time AND they allow Madalyn and her guest to really dig deep into the subject - beyond just 280 characters. They also appeal to a whole host of people who prefer content in video format than social media posts - one of the main reasons we love content repurposing! Or, how about then extracting the audio from the Facebook Live video, and producing a podcast episode. Find out more here. Content on Twitter is very fleeting - you tweet one day and it’s gone, way down your timeline the next. But with Facebook Live, all your past live videos are saved forever onto your profile and you can even create a playlist, like on YouTube, to showcase your favourite videos. But the repurposing doesn’t stop there, oh no! Did you know that there is a way you can eternalize your best tweets on Twitter? Madalyn’s Twitter Chats are very popular and move very fast - it’s hard for people involved to see every tweet and every great takeaway. So, she uses Twitter Moments. Twitter Moments are a way to curate a group of tweets into something that lasts permanently on your profile. Just like Instagram highlights but for Twitter! You can create a moment about your own tweets, about an event, or testimonials that other people have given you. By using Twitter Moments, people who missed the chat OR people who want a summary of the event can click on the Twitter Moment and see a round-up of what’s been discussed. We also discussed how well Twitter Moments would work if you have a podcast, like Madalyn and I do. You could create a moment from all the tweets you’ve posted about the episode, or a round-up of tweets about every episode that you keep adding to, week on week. It’s a really exciting way to repurpose tweets that are already out there in the Twittersphere, and not something that many people are currently doing. Starting now is a great way to gain exposure and make yourself stand out! But the most detailed piece of repurposing is yet to be done! After the Twitter Chat, Facebook Live and Twitter Moments are done, Madalyn then does even more with the content and puts all the questions, answers and 10 comments from participants into a blog post on her website. This is another brilliant way to give Twitter Chats more longevity and repurpose them into a format that can be seen again and again. The least time-consuming way to do this is NOT by taking screenshots, as I originally thought, but by taking the tweets and embedding them onto your website. Each tweet has an “Embed Tweet” option in the dropdown menu and you can just copy and paste this onto your website. When IGTV came out earlier this year, Madalyn was super keen to find a way to incorporate it into her Twitter Chat repurposing. She started creating short videos where she would discuss the Twitter Chat just gone live and give her “two cents” on the topic. However, Madalyn explained that for her this particular platform didn’t work well - she found that people just weren’t interested nor engaged. Therefore proving that sometimes, it’s better to focus on a few platforms that you KNOW will work than trying to do them all. IGTV is still in its infancy, and we’re all still figuring it out. After the initial ‘buzz’ when it launched, activity on the platform does seem to have slowed down, but who knows what IGTV will be be a year or two. Twitter have just come out with a new feature where you can live stream on the platform. This feature works on the mobile app and will show you, once you open the app, who is live streaming out of the people that you follow. Who is excited to experiment with this new feature? Madalyn told me that she will follow the same format that she did for Instagram Live, where she shares her thoughts on the Twitter Chat, on Twitter Live, after it happens. I can’t wait to see how it grows and develops – I anticipate it will be popular as followers will already be on Twitter after the chat AND already engaged with the content. Whether you want to host one or simply participate in one, there’s so much to be gained from Twitter Chats and so much repurposing that can be done from them! So how about you - do you love or loathe Twitter? Have you ever taken part in a Twitter Chat? How about creating a Twitter Moment? Please do let me know in the comments below or reach out on Twitter, Instagram, or Facebook.